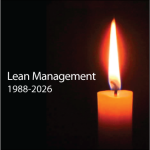 If Lean management were to pass away someday, what might its obituary be? Lean Management passed away this year at the age of 38. The cause was complications from confusion, complexity and, in the end, apathy and neglect. Lean management dedicated its life to helping people improve processes in ways that did not harm others, with the wholesome intent to benefit business and society. Lean was influential and developed a small but loyal and passionate following. It received widespread recognition for having turned around numerous organizations in manufacturing, healthcare, retail, and other industries. Despite these prosperous outcomes, Lean was unable to break into the mainstream of management thought and practice. Its sincerity and good intentions were eclipsed by misunderstandings about its ties to an earlier form of progressive management, self-serving interests, deeply rooted norms, and the advancement of technology. Lean’s aggressive efforts to defeat batch-and-queue material and information processing ultimately failed due to its inability to learn from lessons past and adapt to changing times. Lean will be remembered most for its heroic effort to make a difference to humanity, its noteworthy and admirable successes, and the intellectual and emotional joy it brought to so many people. Lean management is survived by 5S, visual controls, value stream maps, A3 reports, and gemba walks. Services are private. In lieu of flowers, contributions can be sent to your local community social services organization. What must be done now if we don’t want to read this in 10 years? Sounds like a sad story, and perhaps it is. Death of the “old” lean management paradigm. In the end lean (XY AKA whether management, thinking, logistics, healthcare, government) grows/develops or perishes due to the structures, and somewhat lead people to keep their behavior of traditional management and psychological forces that are seldom brought up or spoken out nowadays. Lean is not a new thing, many companies (often unheard of) do similar, and yet they don’t call it lean, and so their work does not come out into the bright media world, and consultants’ world where only the bright examples count, and not so much on the development of people over time to achieve the unthinkable. May lean management transform into an attitude that better can be achieved with given resources (that includes people as much as machines), adapting current structures and procedures by open dialogue, and collective action along a shared vision (not just a vision statement on the company’s website and entrance). h/t Bob making a bold point, even though it might provoke many of your colleagues, and people who preach lean management on the tools only. Joe Knape: Better, more structured training for managers and leaders interested in Lean. Move away from examples in manufacturing/factory floor to other verticals. Focus on the how over the what or the why.